BRAD PENN High Performance Oils are specially formulated to meet the demands of racing engines. Pit Stop USA is The Online Motorsports Superstore! In 1997, American Refining Group, Inc. (ARG), a privately held energy company headquartered in Philadelphia, PA, purchased the Kendall/Amalie refinery located in Bradford, PA, from Witco Corporation. As a result of the sale by Witco, of the KendallA and AmalieA brands to a third party, a new name was given to the products produced at the site: Brad PennA Premium Pennsylvania Grade Lubricants. Founded in 1881 at the height of the domestic oil boom, the Bradford refinery is the only refinery processing 100% Pennsylvania Grade crude oil. It is also the oldest continuously operated lube oil refinery in the world. Due to the consistency of our feedstocks, the quality of our products can be traced from the wellhead to the finished packaged product. ARG's refinery and blending and packaging operations are ISO 9001:2000 certified. The Bradford refinery was the first in the United States to carry the ISO 9002 certification. BRAD PENNA PENN-GRADE 1A High Performance Oils PENN-GRADE 1A High Performance Oils are specially formulated using high quality PENN-GRADETM base stocks and select additive technologies to meet the stringent lubricating demands of high-performance, highly stressed, street and racing engines. They deliver excellent shock load and high temperature protection to heavily stressed engine parts including bearings, camshafts, rings, and pistons. They reduce internal friction allowing for increased horsepower output while maintaining their strong lubricating film protection even under the most demanding torque and extreme temperature conditions. These high performance formulations also provide excellent antifoaming and shear stability characteristics, exceptional high temperature protection from thermal breakdown, superior film strength, and strong anti wear properties. 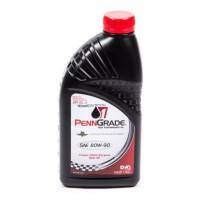 We feature Brad Penn Penn Grade High Performance Oil at low everyday prices.